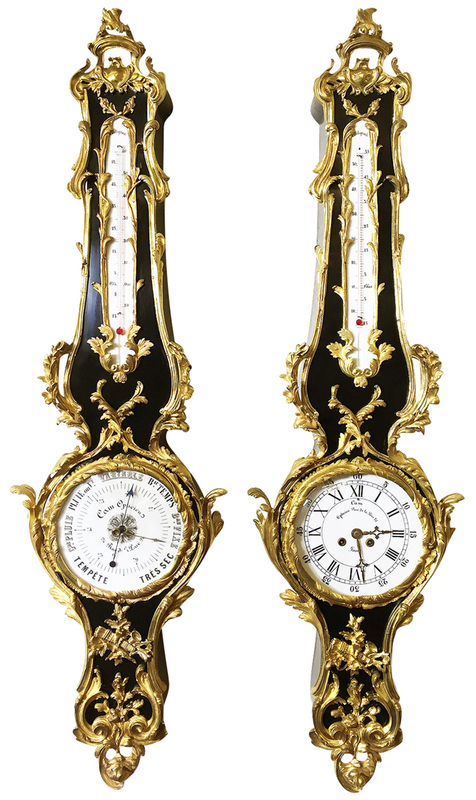 A Very Fine and Palatial Pair of French 19th/20th Century Louis XV Style Ebonized and Gilt-Bronze Mounted Cartel Clock and Matching Barometer by La Maison Cam Opticien. The pair similarly surmounted with gilt-bronze ornaments depicting scrolls, acanthus and floral bouquets with fruits, acorns and a quiver with arrows. 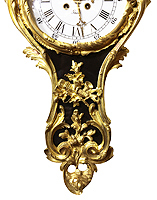 The cartel wall mounting barometer's circular porcelain dial with a glass cover, the face signed "Cam Opticien - Rue de la Paix, 24/ Paris"(faded) with the different atmospheric pressure variables in French "Tempête, Cde. Pluie, Pluie ou Vt., Variable, Bau. Temps, Bau. Fixe and Três Sec." 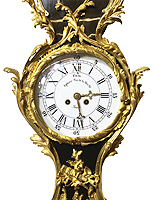 The cartel wall mounting clock, also with a circular porcelain dial with a glass cover, the face with Roman and Arabic numerals and signed "Cam Opticien - Rue de la Paix, 24/ Paris". Circa: Paris, 1890-1900.